Hi again, That looks really interesting, and simple. I have two grid dip meters, but if I had none then I would be tempted. My 38-year old meter is still going strong, although the figures are not so easy to read. Perhaps I need to re-calibrate it? It is still by for the best performing GDO I have ever used. My new one looks a lot neater, but the meter does dip a little when tuning the band(s). 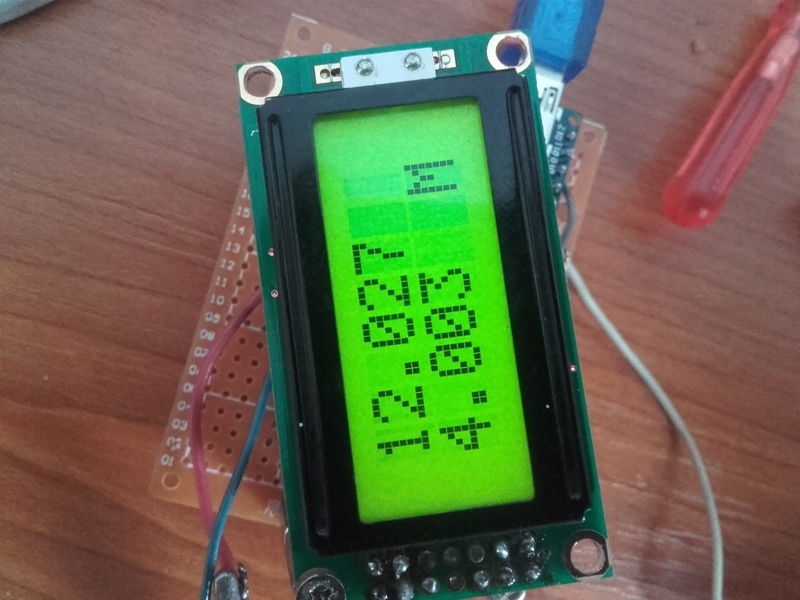 I used a cheap frequency counter from Ebay. At the moment I'm still waiting for PCBs from China. As soon as I get, I reported on My site an here. Sorry but I missed this massage. In effect it is difficult to detect, but a very weak couopling gives the best accuracy. A tight coupling can cause the GDO to be pulled off frequency by the circuit under test. 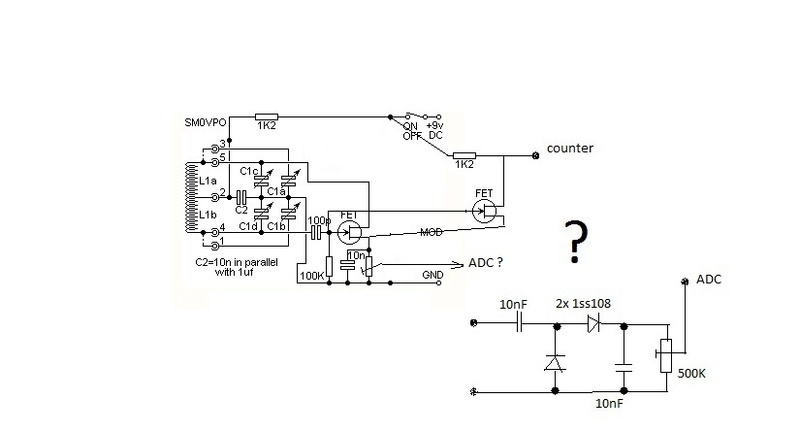 why a DIP is not always with the same amplitude for different LC configurations on this circuit ? It was so simple in the end ! i don't give up on the digitalised GDO , just that i have to delay that for now . You remember the first GDO i ever bult from this site for testing security labels , somewhere in the first pages ? For "really" low frequencies I used the enamelled wire from relays. You can pile-wind then using an electric screwdriver, then it should bring the frequency down. Any way parts of the code are usable for other projects also. I tried to depict in a few lines what it does now. I intended to add a joystick to easily navigate through a little menu (also not donne) . If you read the little description you can see that you may theoretically use the frequency meter part for your projects at higher frequencies also just by tweaking the gate timer , but i can tell that the uc's electronic circuitry for some reason won't go higher than ~ 50 Mhz . * timer one T1 input is port PD5 on the ATMEGA328P cip , that is in fact PIN 5 on ARDUINO NANO board , this will be the 2 byte counter register which can count up to 65536 . * an other set for "close to zero error "
TCCR1B &= B11111000; // stop counter1 by setting CS12, CS11 and CS10 to "0"
... then try adding the 15pf + 15pf AND the zeners. See if the oscillations stop. I would expect the frequency to increase when you use varicap/zeners, maybe 5x the frequency, but this circuit usually oscillates so easily. i removed the zenners , added the 15pF changed the BF245 with BF256 , same result. Usually when i build an amplifier i get a wonderful oscillator. I think it might oscillate , i put on a 10 Mhz osciloscope . It does show a very high frequency signal , actually i can receive that with fm radio on 98Mhz . That's bad i wanted a frequency range to be maximum 10 Mhz . if i put back the zenners the signal is gone . And also no matter what capacitor i put instead of the zenner the signal is same , after capacitor increase, above 1nF the signal is gone . Isolate the fault - is it the oscillator or the zener tuning? If it does oscillate then make sure you have the zeners the correct way round (DC volts across them, with +ve to cathode). If it does NOT oscillate then you have a basic oscillator problem (wiring or defect device). Assuming you have checked the circuit is correctly wired ? There are large varicaps available for MW applications, but I have never used them. The varicap-zener still gives you good capacitance ratio, so you can still have a reasonable frequency ratio - just a higher freq. range than the variable caps, thats all. Admin wrote: The 16-V Zener has a capacitance of about 15pf at 2 volts, at least those I tried did. LEDs also work as varicaps, but the capacitance is a little less and they seem to fail at higher frequencies (above 200MHz). Good luck with the zeners. hmm , so i could estimate max zenner capacitance about 30 pF ... if i put 33pF for the fix capacitors in the end it would be really high frequency . Maybe i can take it down around 8 Mhz with the coil .. The 16-V Zener has a capacitance of about 15pf at 2 volts, at least those I tried did. Admin wrote: It is looking good. I am sorry but I don't have any 24-V Zener diodes or I would willingly send you a few. I have bought several zenners , i put there 2 of 24 V .
I also have capacitors from 33pF to 470 pF. I don't know how to estimate the zenners capacitance . I know that with 2 series capacitor connection the equivalent is smaller than the smaller from both . Should i put there 100pF and see what happens ? Or maybe 330pF ? if the zenner can go up to 330pF , than Cmax vould be ~165 pf and Cmin a little lower than the zenner can go , All most like the variable condensator u used . I don't keep many spare discrete components in stock . I need to buy two 24 V zenners as varicap diodes and the dc blocking capacitor for them . What would be a reasonable range for them ? 33pF ...100 pF ? If you have files to add then I can host them for you. Just send me the files. I also think it must be possible to create anb HTML server where guests can post pix and files, then link to them in the forum. Hmmm ... maybe the facility already exists ... will cheque. Admin wrote: Yes, you must keep us informed. Code would be really appreciated. Will post the circuits as soon as they are drawn and viewed. Yes, you must keep us informed. Code would be really appreciated. hi , i will post here all step by step ,also code or hex file , maybe someone wants to experiment and it will not be "confusicus" it will be "simplicus" ... now i have to find some FET s , most available that comes in my mind would be BF245 , but i can get some other types also. And i still have to get some of those diodes . For some reason it's easier for me to get development boards or even complete plc's than discrete components . Oh and i have a box full with valves , when i will have time to play, i think i will build something around here , maybe a radio . It gives me a great thrill when someone can take one of my projects and "run with it". Please DO keep the photo's coming. I would also be interested in a final "circuitus-diagramus confusicus" when it is finished. Small comment about frequency range, there is absolutely no reason why you cannot use more coils to cover a wider range. Another project I will phograph when I return to Sweden is a Tunnel-Diode oscillator. In principle it is two resistors, one capacitor and a 9-volt battery. If you connect the two crocodile clips to anything that resonates then it will oscillate at that thing's resonant frequency. In my courses I connect it to a roll of URM67-U cable (with the far end shorted) and switch it on. It always oscillates at 1.1210MHz, because the cable length is 88.314 metres. I use a counter or a spectrum analyser to view the frequency. first row now is a voltage . Voltage feedback (first row, set point being 12V) on pin A3 is the input of a discrete PID controller and pin 6 is it's output (Fpwm =65kHz). 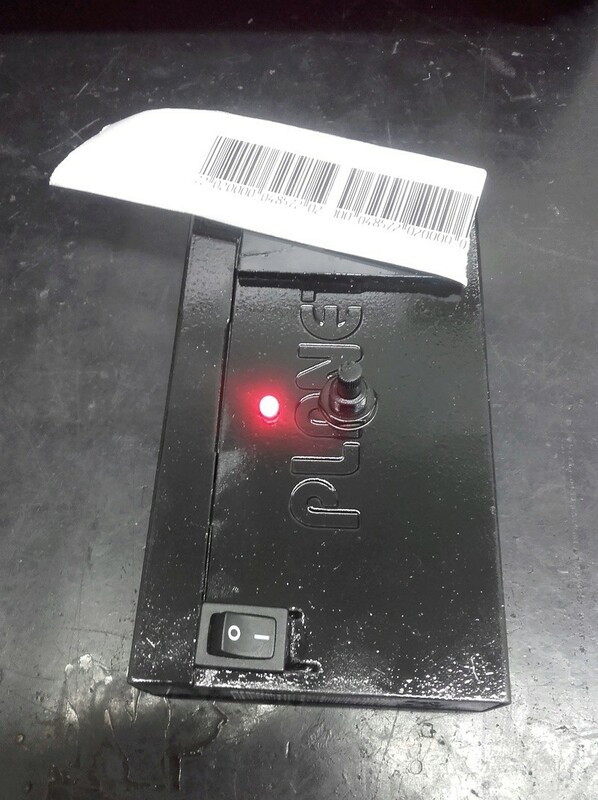 Frequency is counted by timer T1 configured as external clock sourced counter (pin 5) and internal timer 2 is used as 1ms gate for T1. i seee ... i'll get to that part later . Now i just put together the boost converter, arduno and lcd . In first place i'll try to write a little program to see on lcd the voltage regulation for the varicaps . 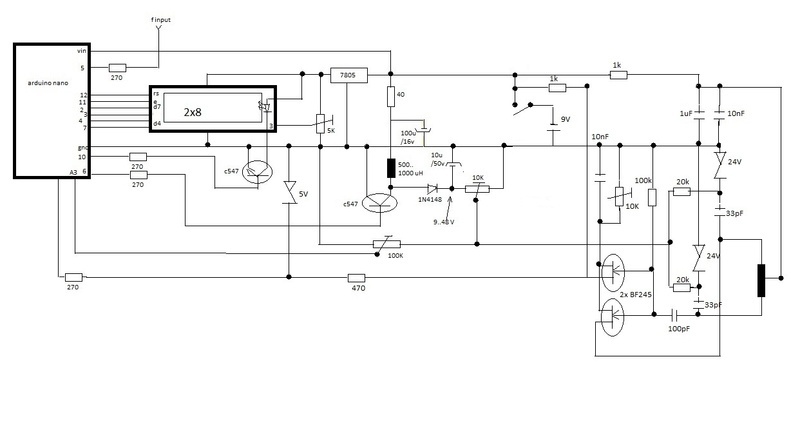 I'm using a PID regulator to control voltage . For the moment i close the PID loop with a voltage feedback . For the non linearity you mentioned i just came up with an other idea , in the end when things work a little bit i just have to close the PID loop feedback on the frequency reading instead of the voltage reading i'm doing now , so it's up to the PID to deal with the voltage . This would be logic since in the end i want to control frequency process not voltage . I will show up with some pictures when i put something presentable together . I don't understand the term 3:1 frequency ratio , also 9:1 capacitance ratio . The ratio of f1/f2 = 3 , and C1/C2=9 ? If so what is f1,f2,C1,C2 ? The frequency is inversely proportional to the square root of capacity, so to get a 3:1 frequency ratio, you need a 9:1 capacity ratio with fixed inductance. BTW, the dependance of diode capacity on DC voltage is very nonlinear, too. If you want to optimize the frequency search, you should use various voltage steps at different parts of the range. The varicaps should not draw any current at all. I also once read that you can use switching diodes to get a really wide frequency ratio. To get 3:1 frequency you need at least 9:1 capacitance raio. 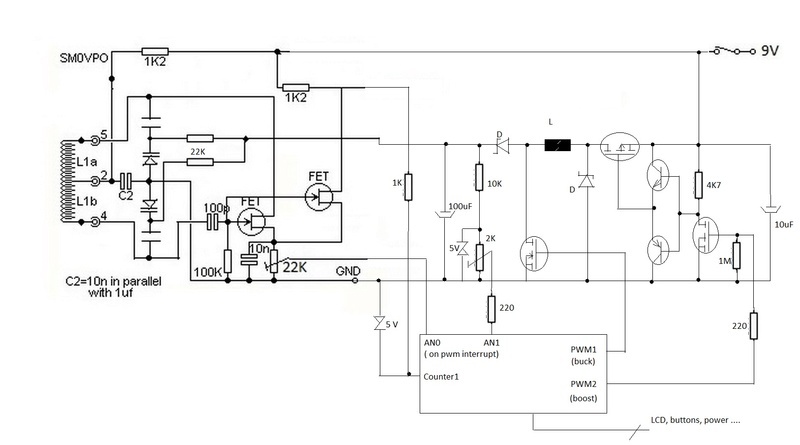 Using an ordinary 1N914 switching diode you can bias it to a specific voltage. When the oscillations cause the RF waveform in the oscillator, the diode will conduct for only a part of the RF sine waveform, and switch in a bigger capacitor for only a part of the waveform. If you have trouble with frequency range then this could be a solution.Also cheap diodes, not varicaps. Oh and one other thing , what f/V ratio would be adequate to start with ? I'm just concerning that if the voltage increment is to big, the frequency variation is to large ... I can express myself better like this : should i hunt for Vout=Vout+0.1 ; or Vout = Vout+0.001 increments ? (since frequency is function of Vout i think this is important) practical experience will tell i think . 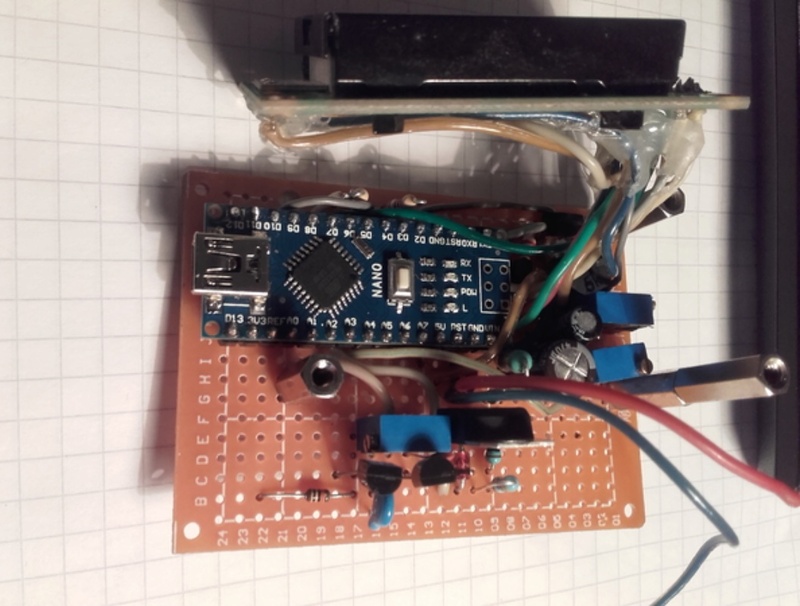 First i'm going to build the boost converter with the arduino and an lcd to test the voltage regulation capability . Also the arduino's counter can't go higher than ~60 Mhz so this is also a limit . I read about some simple counter IC's that can be used to divide by 2 ... 10 .
the voltage converter seems to be an overkill to me. 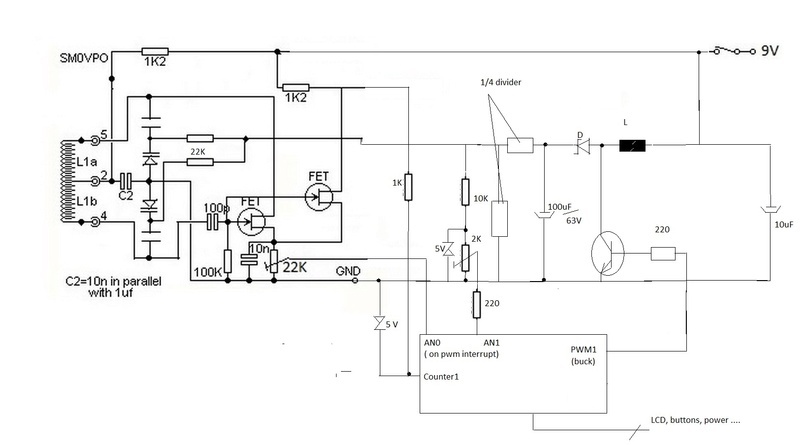 I would use a simple voltage doubler e.g. with 555. It should do. Or even simpler: two 9V batteries in series giving 18V! Mention that the varicaps take nearly no DC. Consider using two batteries for feeding varicaps and only one of these for the rest of the GDO. 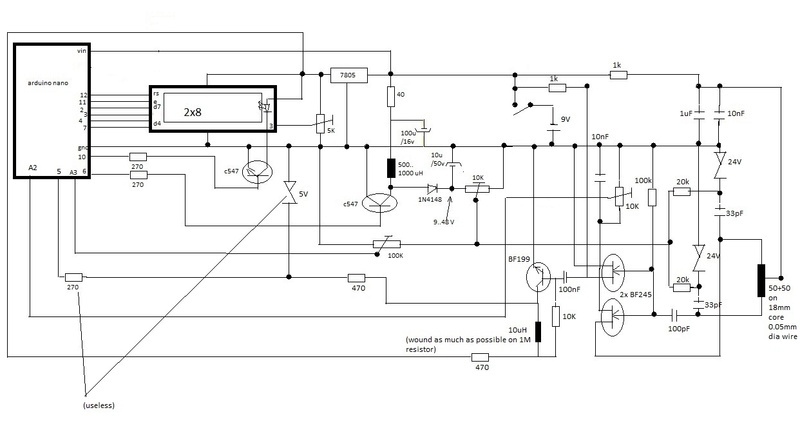 it's not about the voltage doubling , i can do that with one tranzistor .. the uC should find the dipp by itself (if you scroll down trough posts you can see the whole development how i got to this) . On the drawing you saw i did not put the lcd , buttons ... and other things obviously needed. That's why you missed the intention . First i wanted to use an ADC to control the varicaps , than i came up with a buck-boost pair and now i consider to only use boost converter . 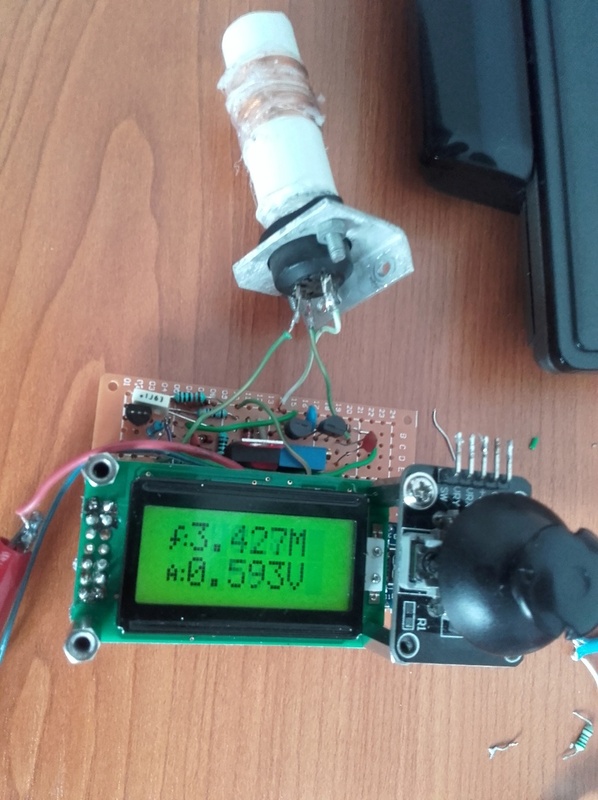 The drawing with the potentiometer is just a suggestion to upgrade existing GDO's to benefit from remote controlled varicap's. If the varicaps take so small current from the source is perfect It means that i can consider as load only the voltage divider feeding the varicaps and the voltage divider of the feedback loop . PS: should i consider the varicap's circuit as a RC load ? What would be it's current (the 2 varicap's) ? Would be ok to aproximate 5 mA max current just to be shore ? I'm trying to tweak around the dc-dc source . My newest idea is that there is no need for the buck-boost pair . I believe that only the boost will do the job . 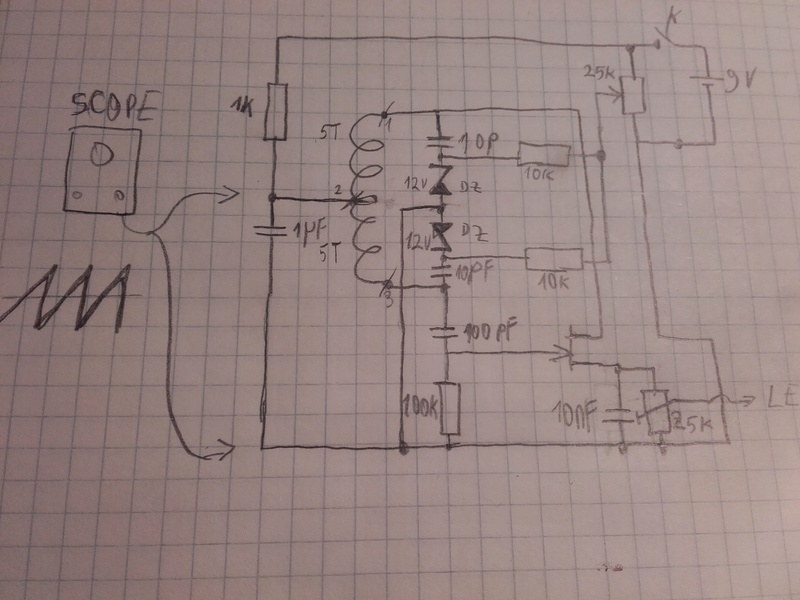 If i use a 1/4 voltage divider to feed the varicap's than the boost converter should range from 9 to 48 V before the voltage divider . i'm trying to get some documentation about how this is done in TV's (no need to reinvent the wheel ) . I'm curious how this search mechanism works in modern tv tuners , which algorithm is used . As i saw when i put my tv to scan, it goes through the whole range, and memories the frequencies where it founds a carrier or something i don't know yet . My uC should do the same just that it has to detect a dipp and display the frequency at which it happened . I will take some time until i put something in practice from all this ... now in my ''free'' time i'm mounting polystyrene plates , mounting doors ... house stuff . By the way have you thought about using also varicap's just without a uC in your versions ? I don't know about how linear this could be , but i think it's easier to draw a dial around a potentiometer than a variable condensator ? Or there could be some other benefits / drawbacks ... ? Oh or maybe a linear potentiometer can be used , those long ones like in dj mixers . Now is somewhat hard to get new varicaps , i intend to use 24V zeners i have already . 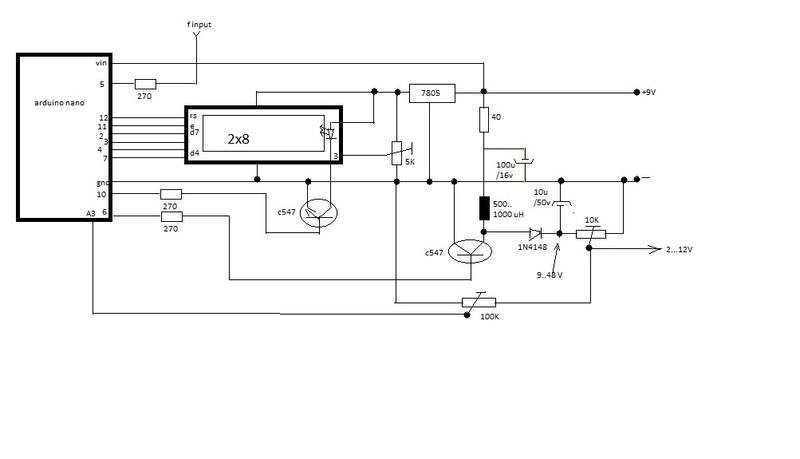 The dc blocking capacitor and the zenner capacitance equivalent calculates like the case of normal series capacitor connection ? 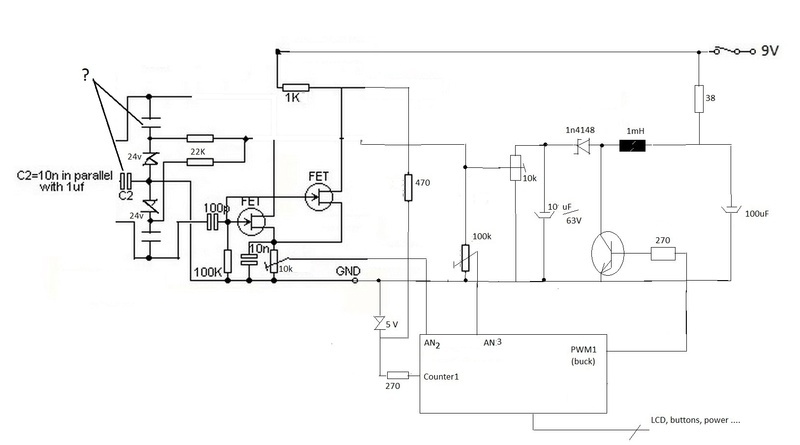 Have you thought of using a self oscillating half bridge converter to provide power for heaters and HT? I knocked one together one evening to power the heaters of some PL519 valves. I will dig out the circuit if you are interested. It used a ferrite core from a LOPT, a pair of TV horizontal output transistors, a small ferrite ring to provide the feedback and a handful of other parts. Efficiency is better than a standard Royer oscillator as only the driver transformer saturates, not the power transformer. Circuit is similar to a CCFL driver. I think it is looking good. l will be really interested to hear how it works in practice. The tuning range will be a bit different, but your should go to much higher frequencies than mine due to the reduce tuning capacitance. If you need more, then don't forget that you can put varicaps (or Zeners) in parallel. for now i can only do theory ... i will make time for this later . I added the dc dc convertor i mentioned . I'm not shore if it works like this , the buck part works for shore, i built an MPPT solar charger with it (and the small Arduino board) . 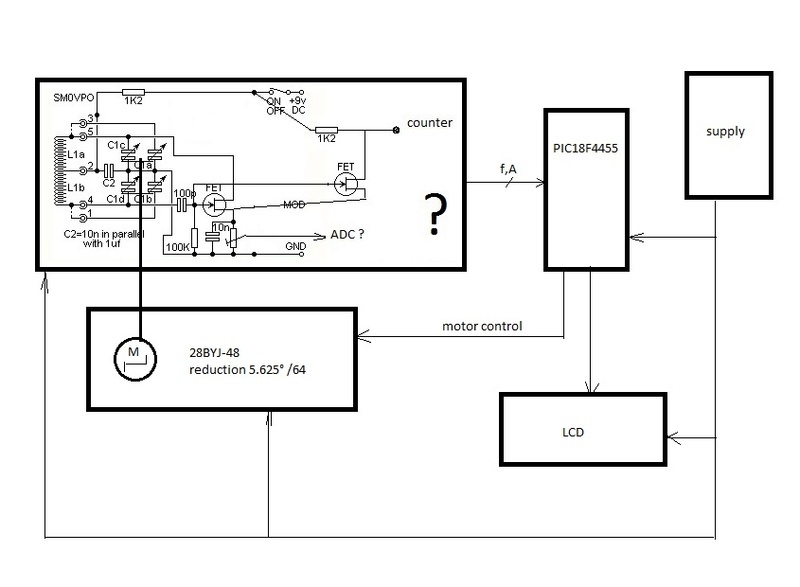 An other option would be to build a separate (analog) boost to feed the buck converter . The picture looks good. You may have to increase the 10K to something a little higher if the diode bias damps the oscillations, but it should be ok.
i think i can easily generate the 2 ... 12 V control voltage with the uC itself , by using a suitable dc-dc converter and one of the uC's pwm pin. So i don't need to waste pins of the uC with the ADC module . As a matter of interest, varicap diodes only need a DC voltage that is higher then the peak RF voltage. If you are using a 9v battery for the GDO then a 12v supply would be fine. Also, vaicaps require the highr voltages to get the smaller capacitances. The maximum capacitance occurs at about 2V. You can also use ordinary zener diodes, which have a very high capacitance, compared to real varicap diodes. Just be sure the zener voltage is greater than the max DC you intend to apply. if i understand well , there is no RF on the source, but there is RF in the drain . Anyway everything should be clear now, meantime i came up with an other crazy idea , the uC should first find the dipp by itself and then measure the frequency . Since i don't know how to use varicap diodes in your schematic i came up with the idea that the uC can drive a little stepper ganged with the variable condensator . Of course if i could use varicap diodes would be much better . I would use a 10 bit R-2R DAC to generate control voltage for varicaps . I read that these diodes should get voltages up to 28 V .
Hi again, sorry about the delay responding. Yes, the picture is perfect with the extra FET. As one other pointed out, the source of the transistor has DC on it, so you don't need a diode detector. There should be little or no RF there. Anyway, hafta shower and dress - off to hospital today to see how my blood is doing. I failed the blood test so they have to drain some blood. Probably why I am aways so tired. Do you have all the info you need now? And there is one more thing - harry wound all his gdo coils as one big coil. i used a resistor to feed the power in one end with no center tap and the current drawn is less dependant on the frequency. i put the resistor in the coil so i can have a different value for each coil. selected them on test. Hi zsolt, i built harrys gdo and it works grate. i have a couple of comments that can help you. 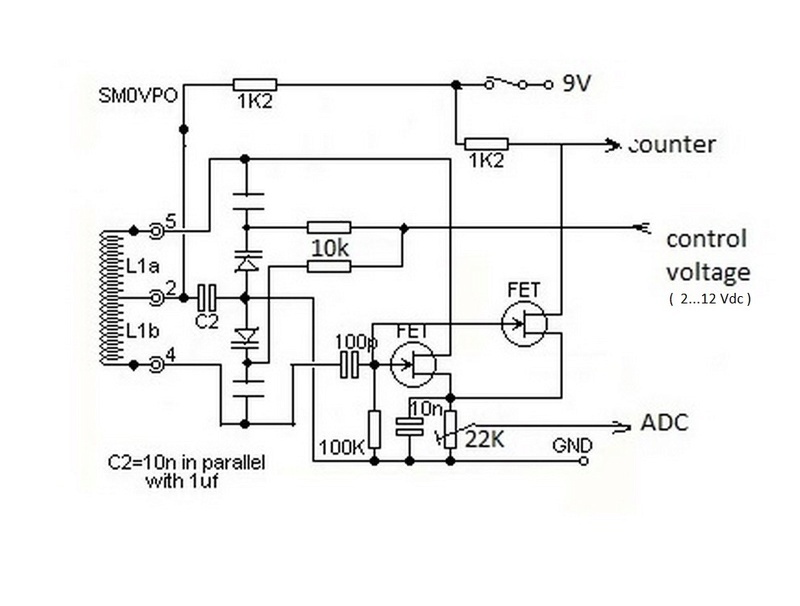 if you want to feed the adc input then you only need a resister like 22k from the source without any diode at all. 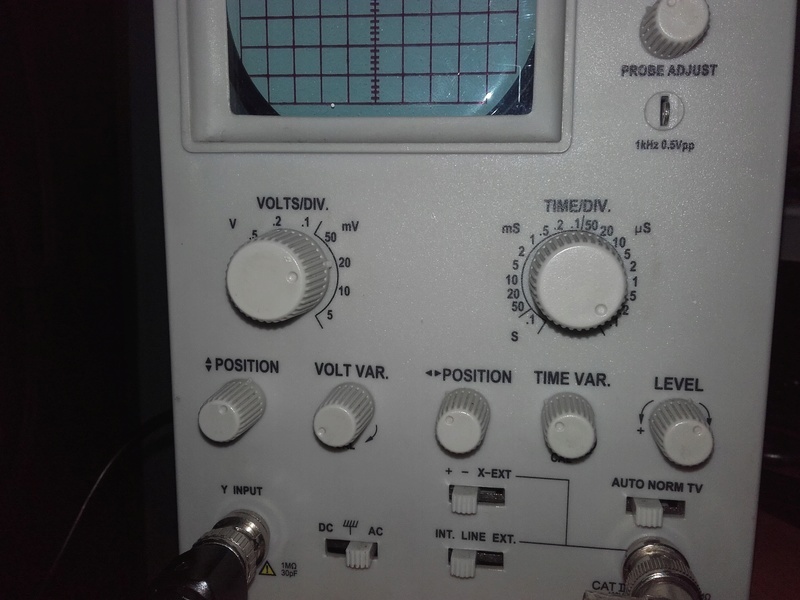 harrys design is a bit too sensitive with the meter in a bridge so i just had a voltmeter on the source of the fet. that works fine. i think harry uses very loose coupling so he has a smaller dip otherwise the external circuit pulls the gdo and he once described using a loop feeding a loop so he could push the second loop inside a can. the parallel fet in your drawings looks good and i will give that a try myself. ascii art is a bit naff on this forum because the characters are monospaced but spaces are not. you can use a - instead of a space and change the colour of them to white so they dont show the dashes. the dash - has the same space as a character. ill let harry answer your other questions cos hes the expert. he said he made this circuit a few times for the last 35 years. When the dip occurs the bar graph should decrease. Actually it does . I discovered that the amplitude of the signal is very frequency dependent . Oh and i discovered the the dip is not always negative . At some home appliances the amplitude is increasing very much instead of decreasing . Anyway it's interesting how useful and versatile a little sensitive oscillator can be. It saved the day , from 100 labels 40 where bad . And i could also see that different labels are not behaving the same way . Probably your GDO should not be digitalis-ed at all , but I m shore that a stronger controller having a 40 Mhz clock could make it . 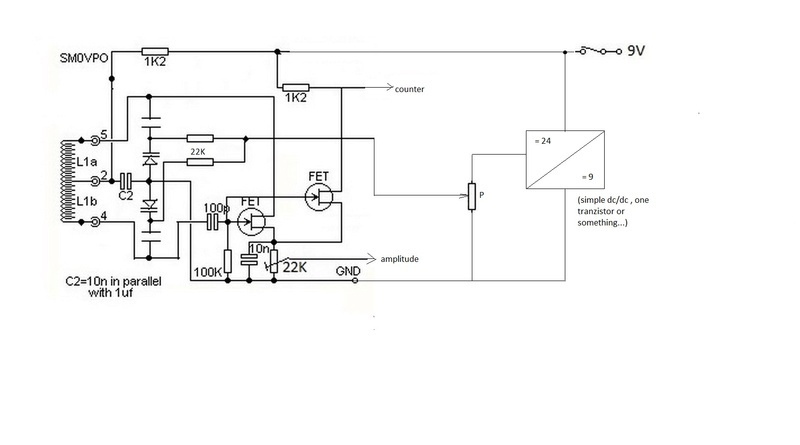 Oh and an other question , where would you connect the amplitude detector circuit in your scheme ? When I give my classroom demonstrations I usually have a 2-turn loop on the input to the counter. I feed the loop over the GDO loop, then use the GDO in the normal way. This is good for about 4 to 25MHz but the counter loop will have to be adjusted for higher or lower frequencies. But this method is not suitable if you want to do as you do: have an integrated instrument. Perhaps you could add a counter pickup-loop built into each coil? Then you can have a diffrerent and optimal loop for each band? 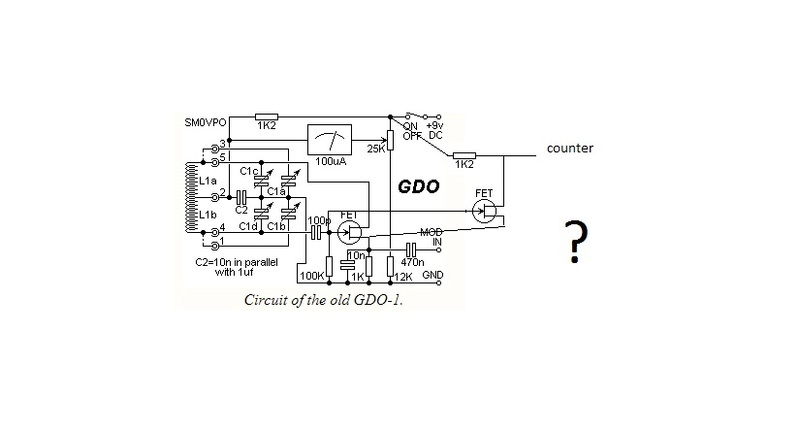 Finally, have you thought about using a paralled FET (source of both FETs connected) to get an isolated output from the GDO? This could be an elegant solution. 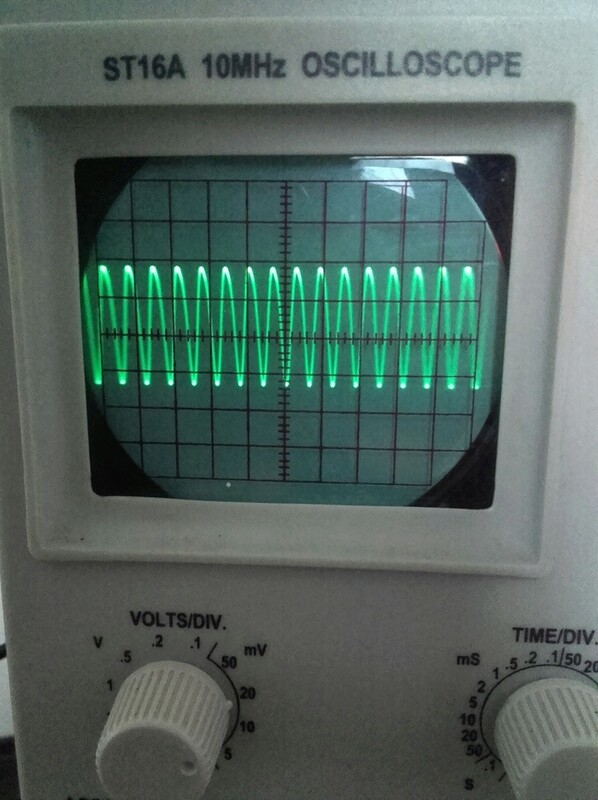 hi , i managed to count the frequency with a 2 turn coil in the gdo , i was thinking about getting the amplitude into the mcu in order to display on lcd ... i found out that detecting the dip is already done in first place .When the dip occurs the mcu shows zero frequency on the display (probably the level is to low for the input pin). So now i know when the dipp is present just that i don't know at which frequency , I could tweak around the program to display the last non zero value for frequency when the dip is present . I don't think i can fully upgrade your GDO to digital, the 2 events are antagonist for the mcu . It does the job anyway . One possibility for measuring the GDO is to take a series resistor (47K ?) and 1nf capacitor from either the gate or the drain to the input of your counter. With the GDO there is about 10v P-P at those two points so you should be able to sniff off a little RF without affecting the frequency (much). Anyway, I want to wish you a very Happy New Year. Interesting fact, today, everybody who is legally an adult (over 18) were born in the 1900's. All "minors" (under 18) were born in the 2000's. first of all best wishes for all . About the gdo 1 , since i'm using a self made frequency meter with 2x8 LCD i taught that i could display on the second row also the amplitude in a form of a bar graph. 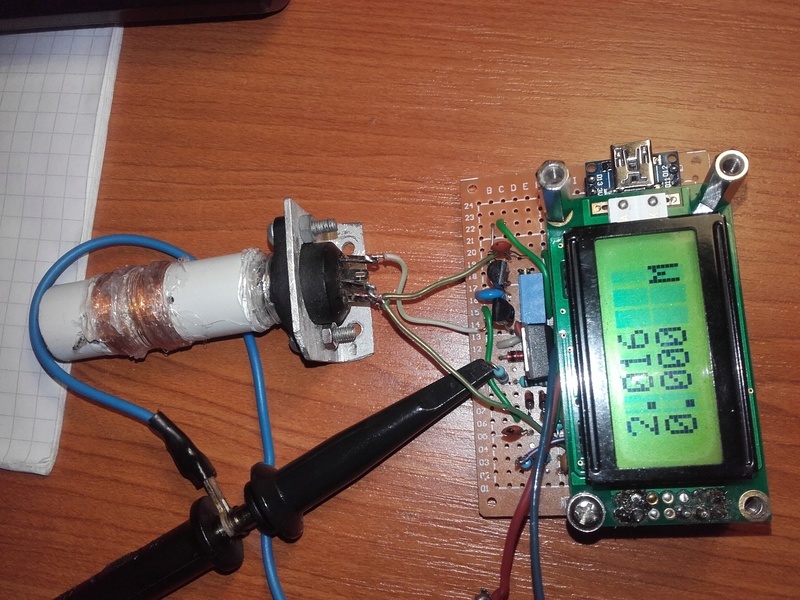 With this i could eliminate the microampermeter ( i used a magnetoelectric device which is not performing quite so well ) . I have an analog pin left free, and i can use internal 1.2V reference for ADC if needed.I have no idea if it can work or not, but where would you connect the analog input (with respect to GND) in the GDO1 circuit, in order to do this ?